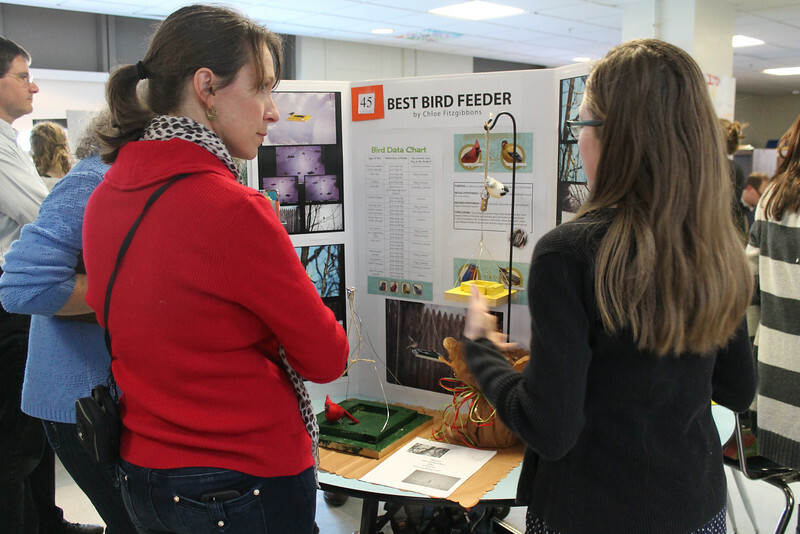 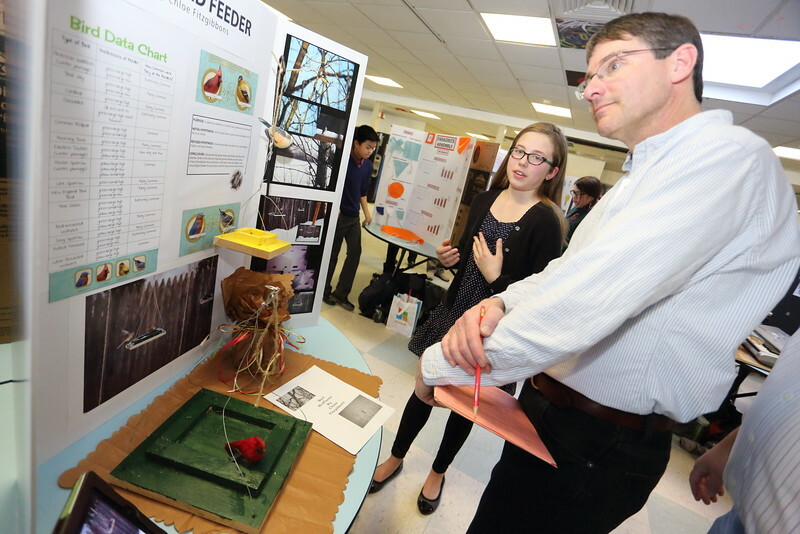 Harvad Conservation Trust judge Kim Manning listens as Chloe Fitzgibbons explains her project, “Best Bird Feeder,” in which she studied feeder type preferences of several bird species. 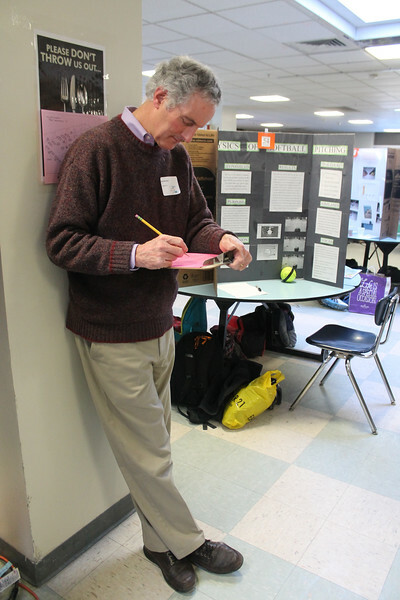 Judge Nick Browse takes a break to score a project. 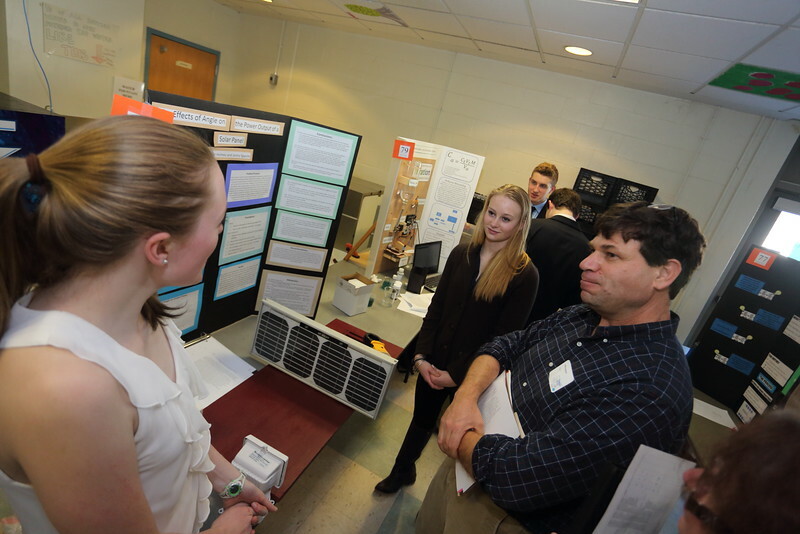 Meredith Greayer shows off two of her control plants. 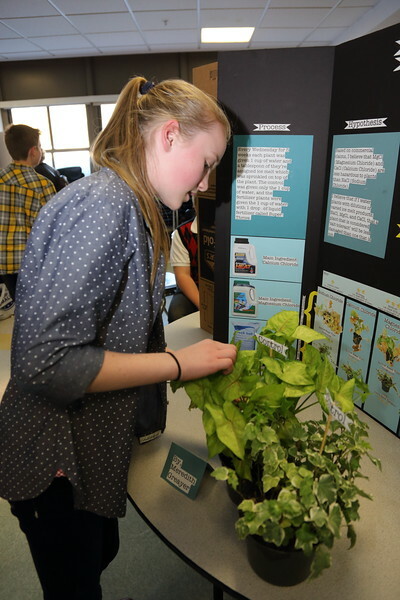 The plants used in ther experiment, “The Effects of Different Types of Ice Melt on Plant Health,” did not fare nearly as well. 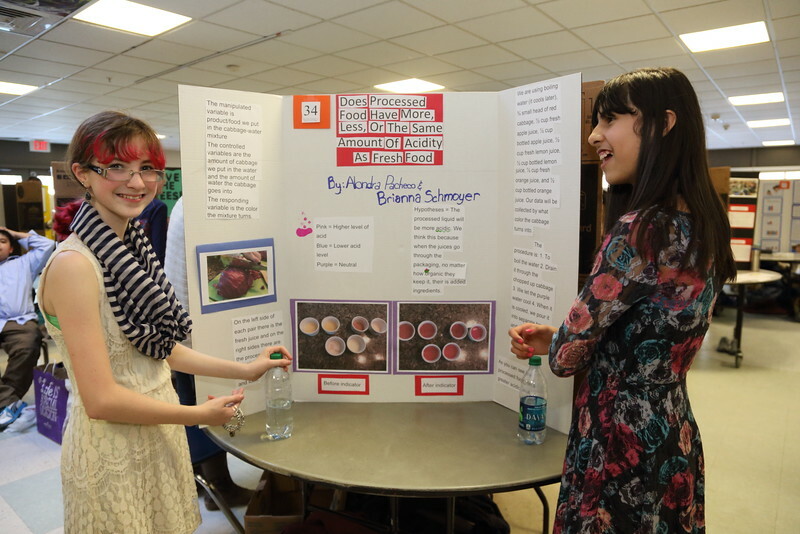 Brainna Schmoyer (left) and Alondra Pacheco talk about their experiment in which they compared acidity levels in processed food versus fresh, organic food. 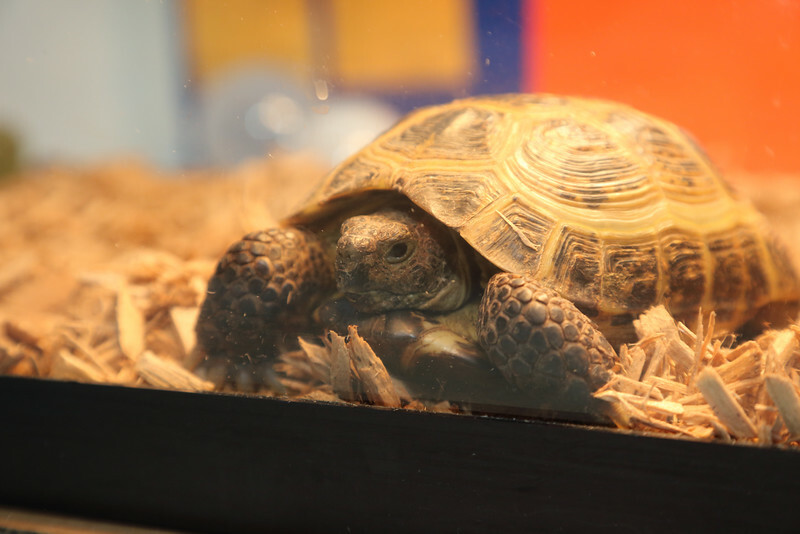 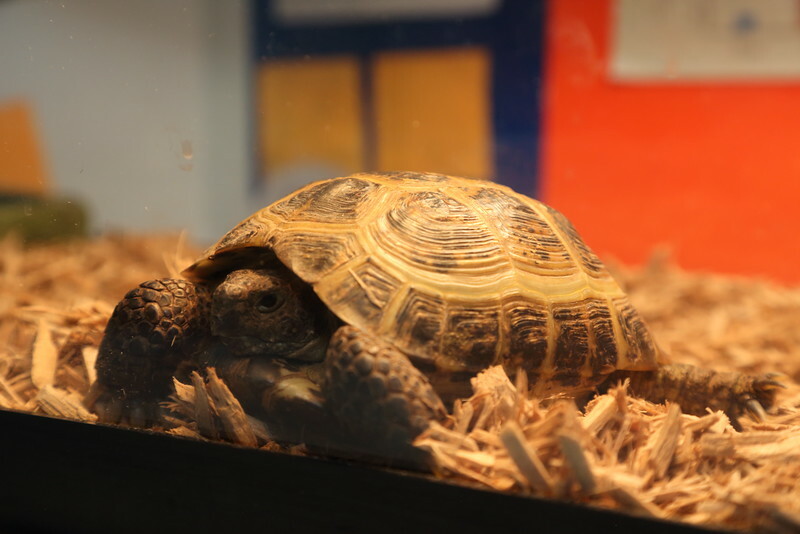 Seven-year old Russian tortoise Nugget didn’t seem to mind taking part in the science fair, nor was he camera shy. 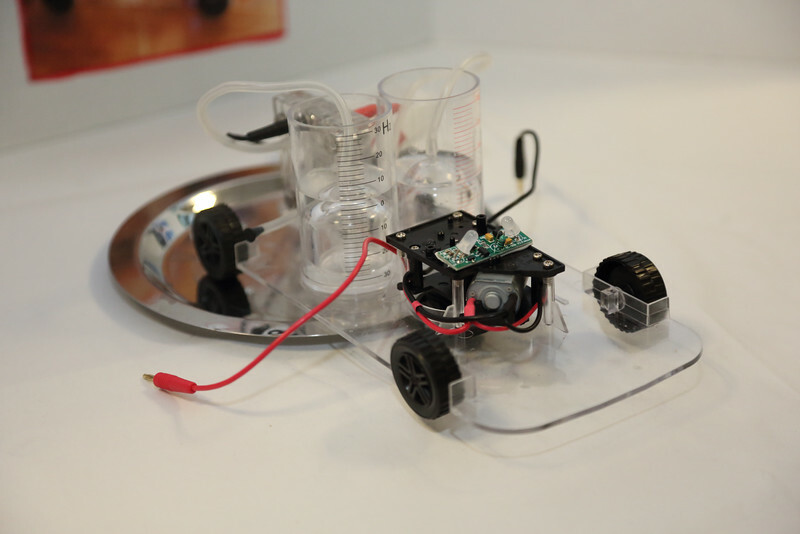 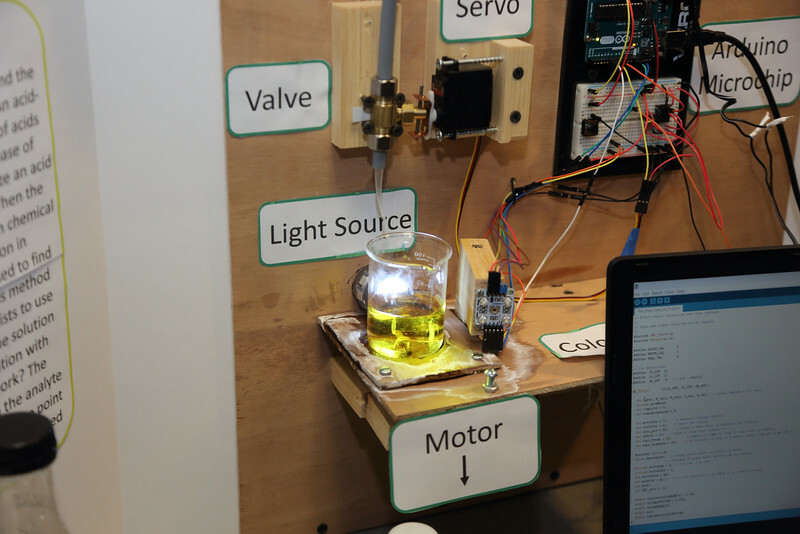 Meenu Ramakrishan and Shrey Kumar used this model car to model hydrogren as a power source. 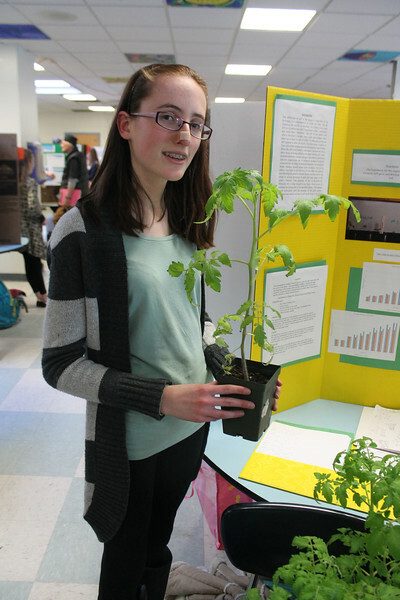 Melissa Meau studdies the effect of pH on the growth and development of tomato plants. 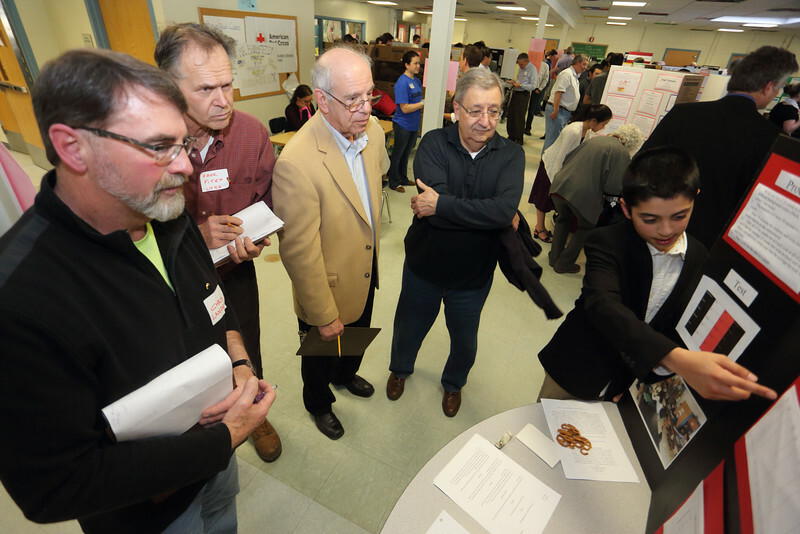 Her finding? 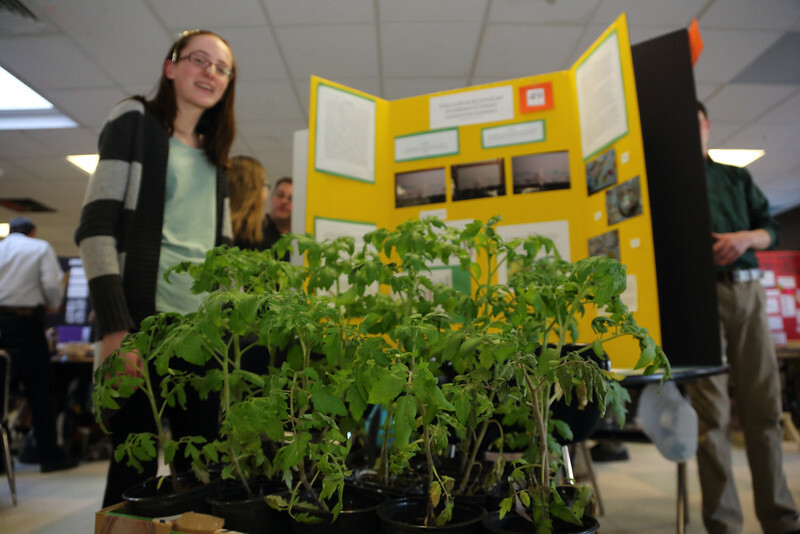 Tomatoes like acidic soil best. 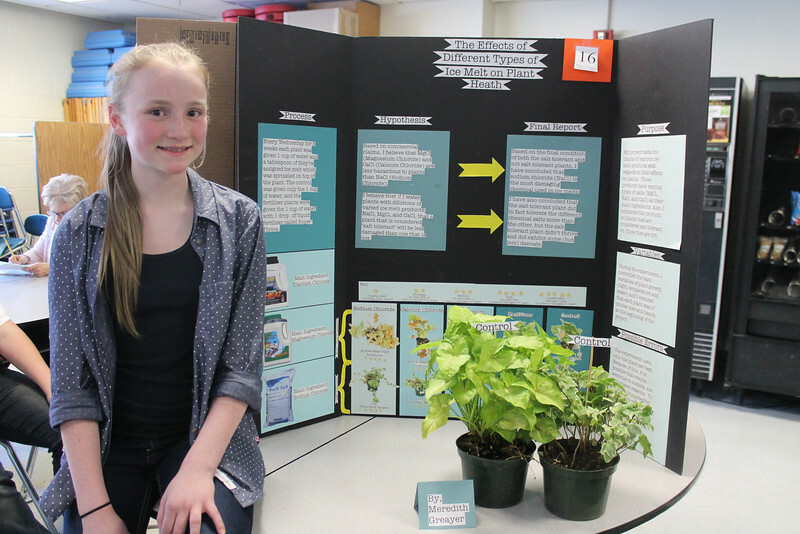 Melissa Meau studdied the effect of pH on the growth and development of tomato plants. 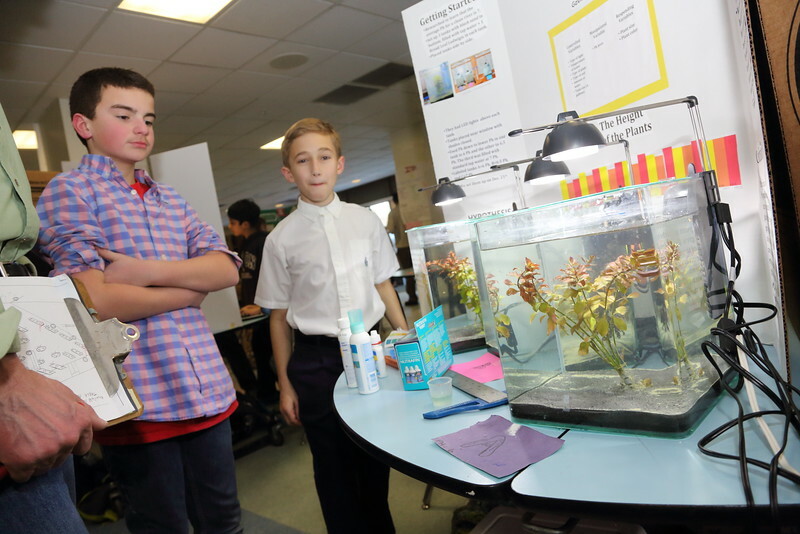 Her finding? 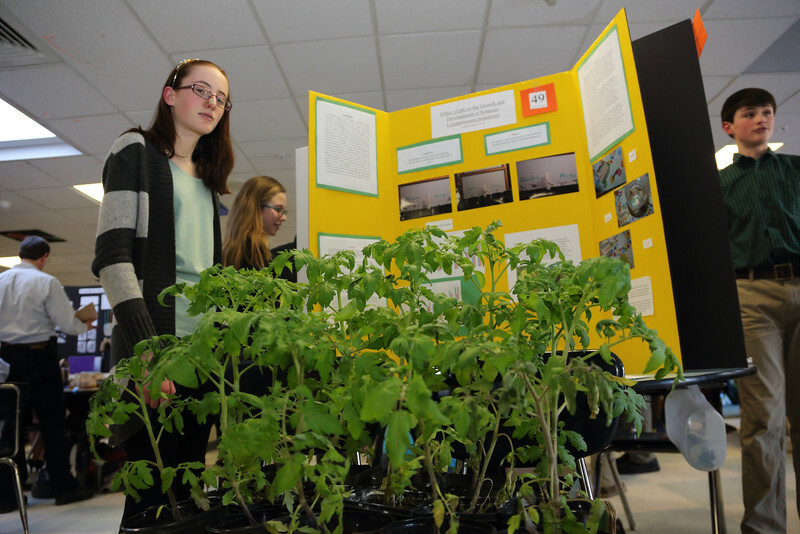 Tomatoes like acidic soil best. 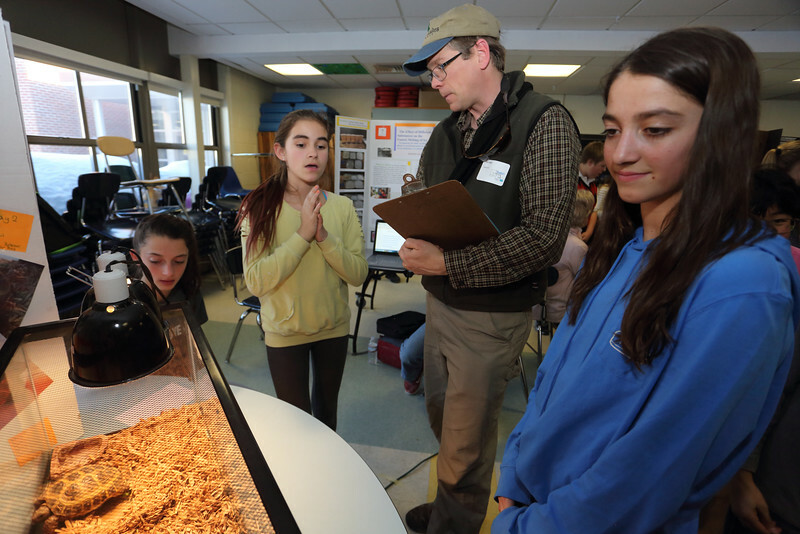 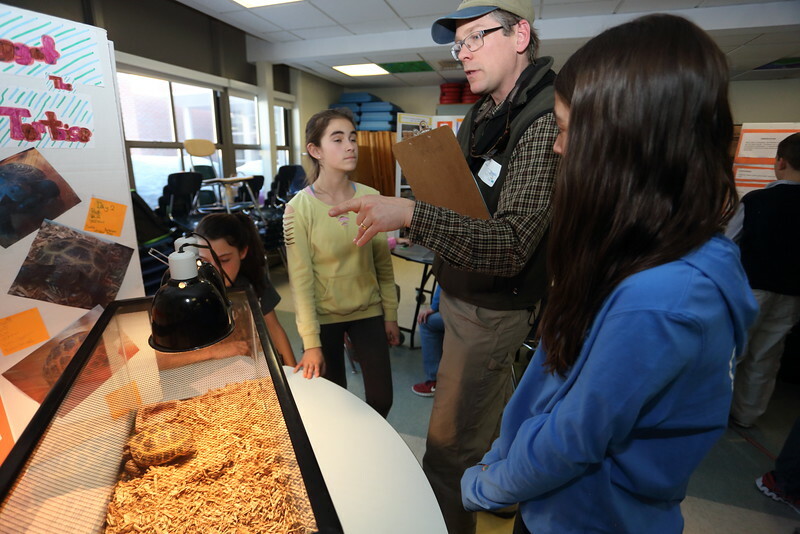 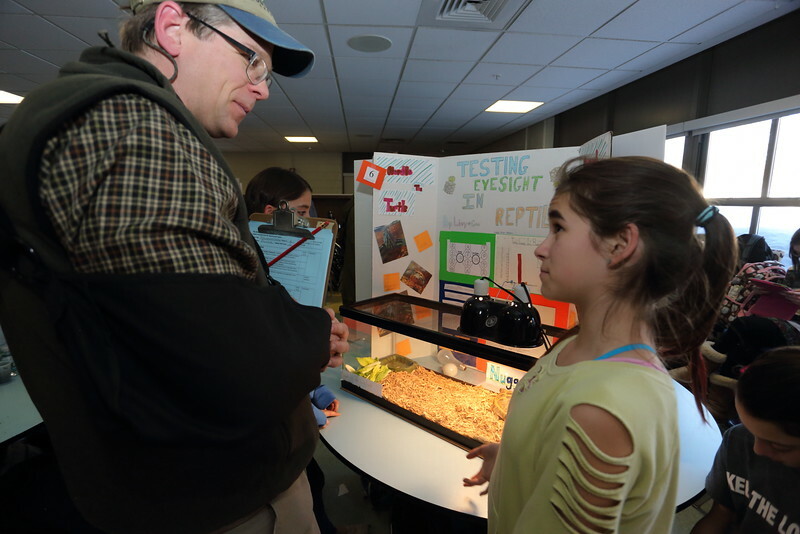 From left: Bella Kehoe, Gia McCabe, Tim Clark, and Olivia Kehoe discuss the eyesight testing they did using Gia’s pet Russian tortoise, Nugget. 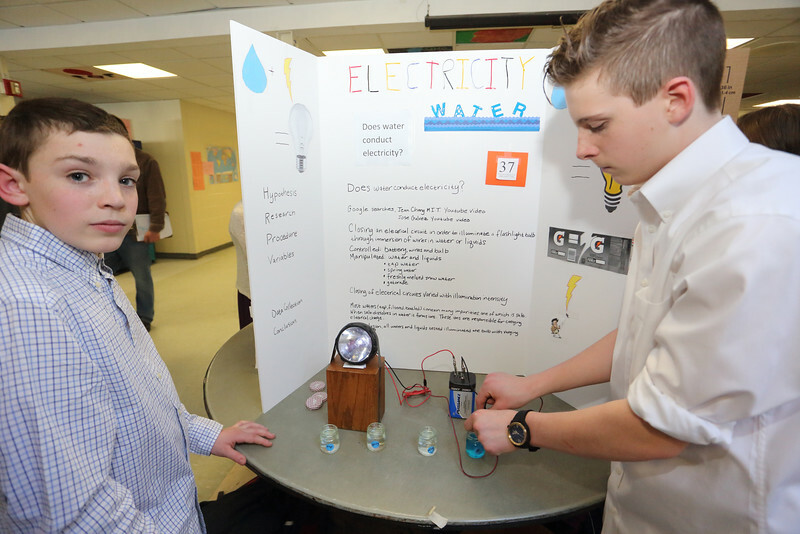 Holden Lee (left) and Jack Hunnewell experimented with how well water and other liquids conduct electricity. 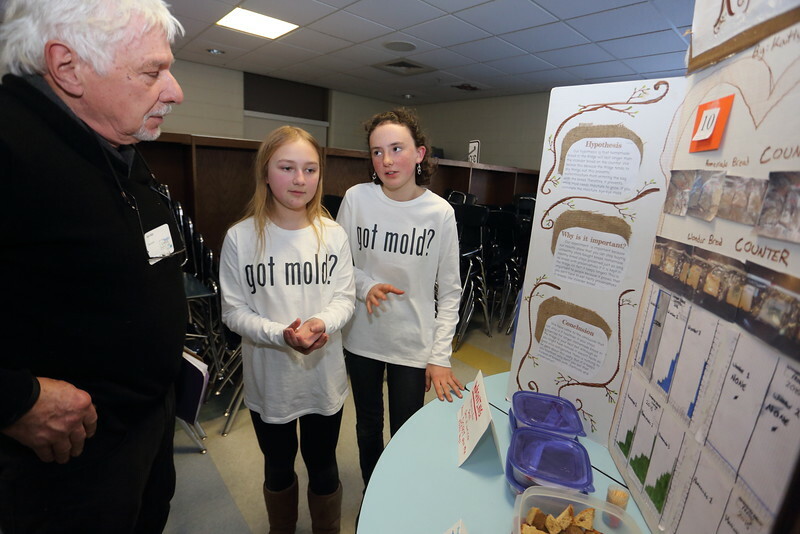 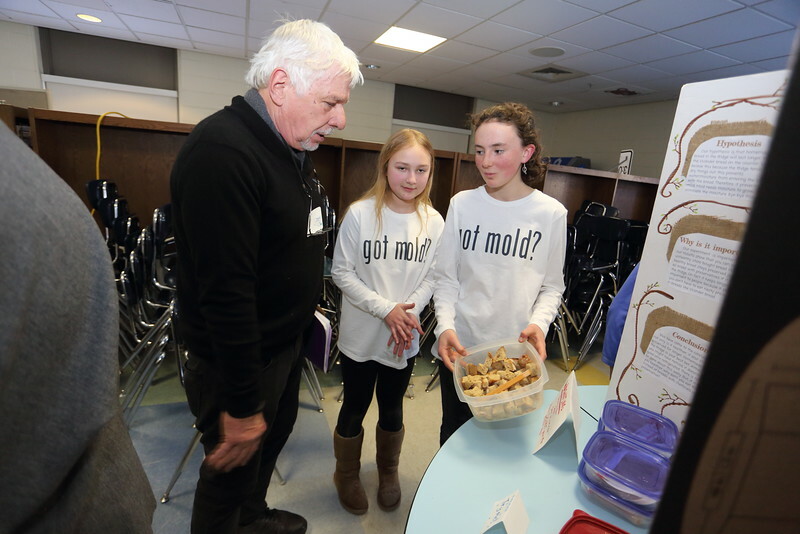 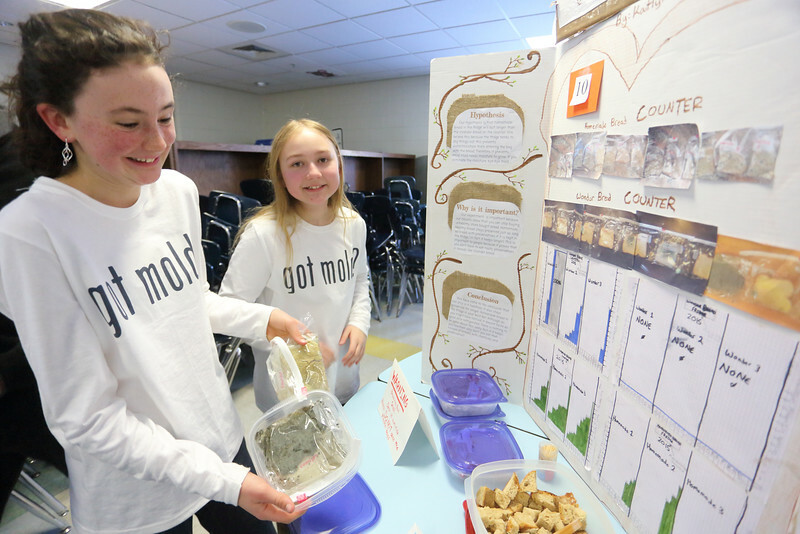 Ask their shirts reflect, Lucia Richards (left) and Kaitlyn Ostrowski experimented with the mold rate of fresh homemade bread versus store-bought Wonder bread. 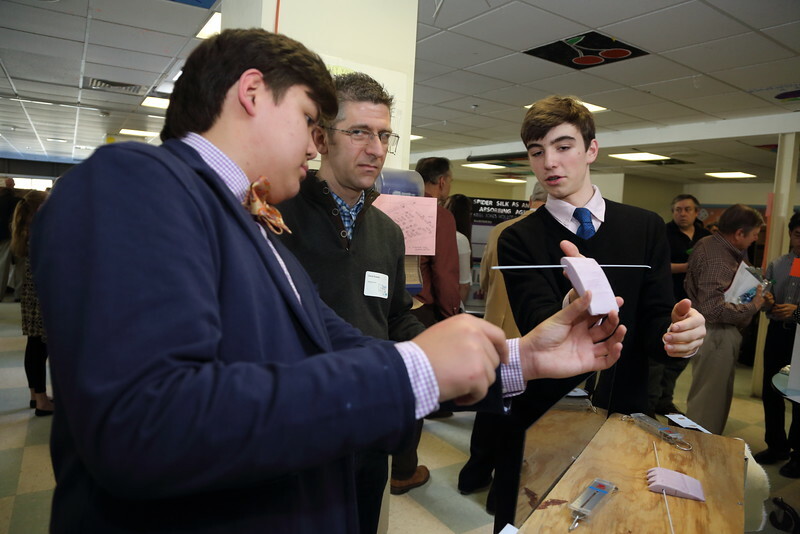 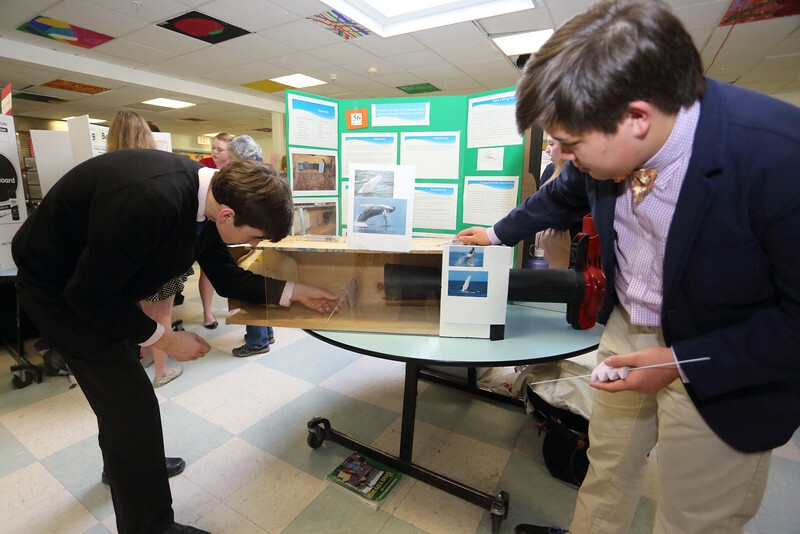 Henry Anderson (left) and Will Thompson (right) explain to David Rowatt their experimentthat tested how the bumps on whales’ fins affects their movement through water. 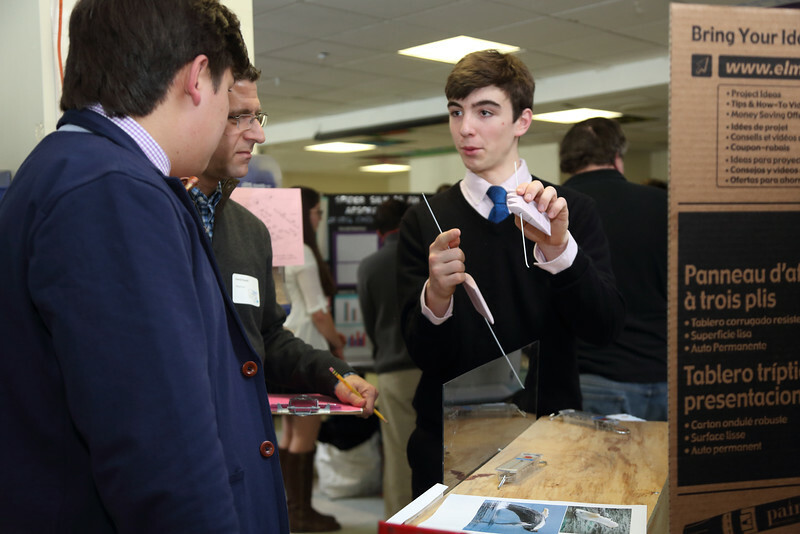 Junior Nick Steele explains his project “Solving our Water Problems at Home,” to judge Pablo Hopman. 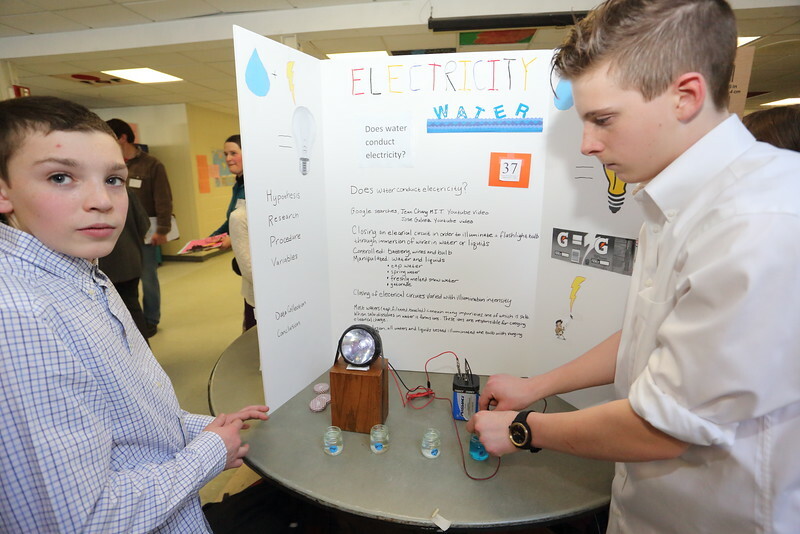 Mark Schweigershausen and Johnathan Stadler’s computer-run titration system took home a second place in the engineering-chem/enviro/physics category. 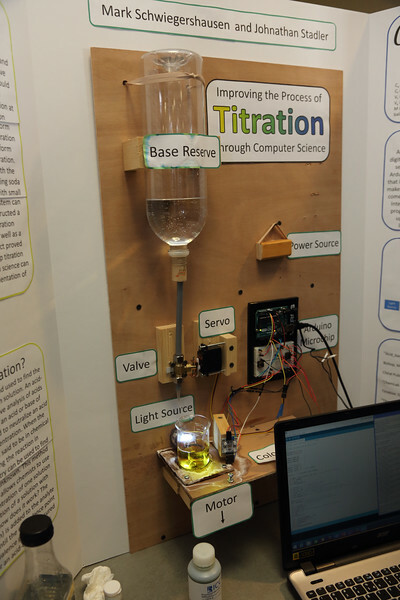 The electronic eye, or scanner of Mark Schweigershausen and Johnathan Stadler’s computer-run titration system is capable of reading titrations not easily discernable by the human eye. 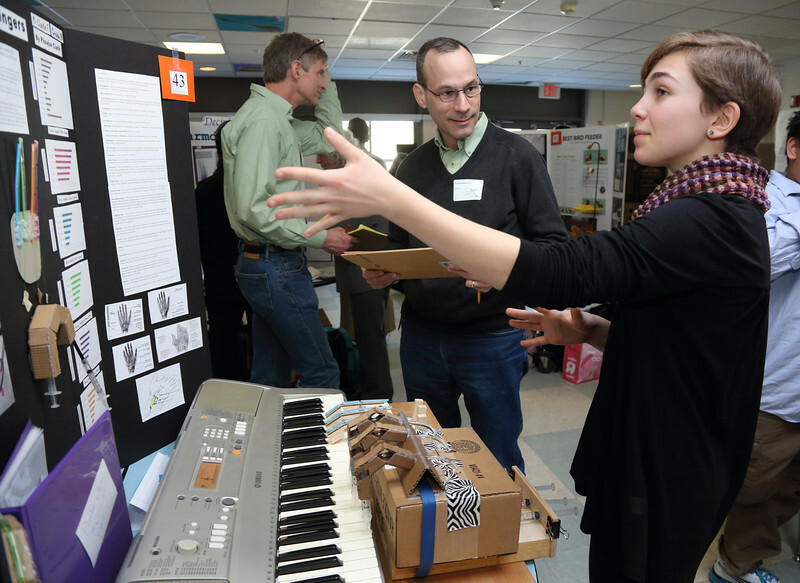 Judge Patrick Sobalvarro listens as Phoebe Clark describes her prosthetic hand project. 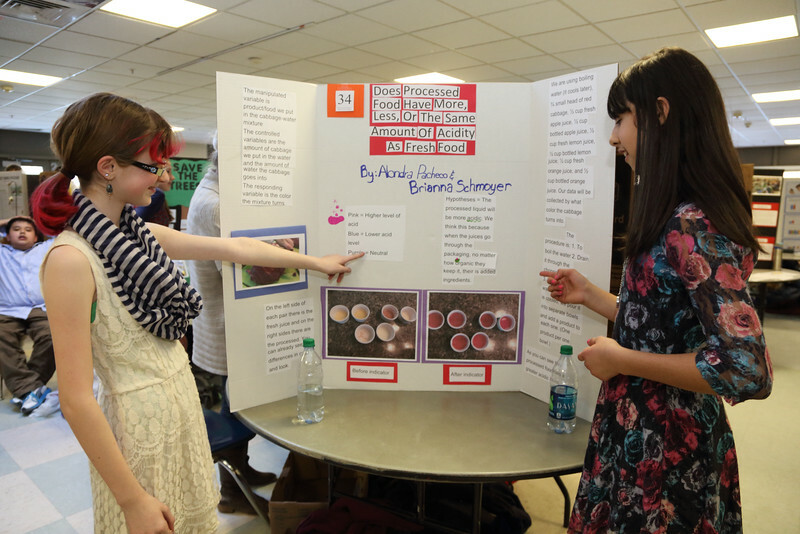 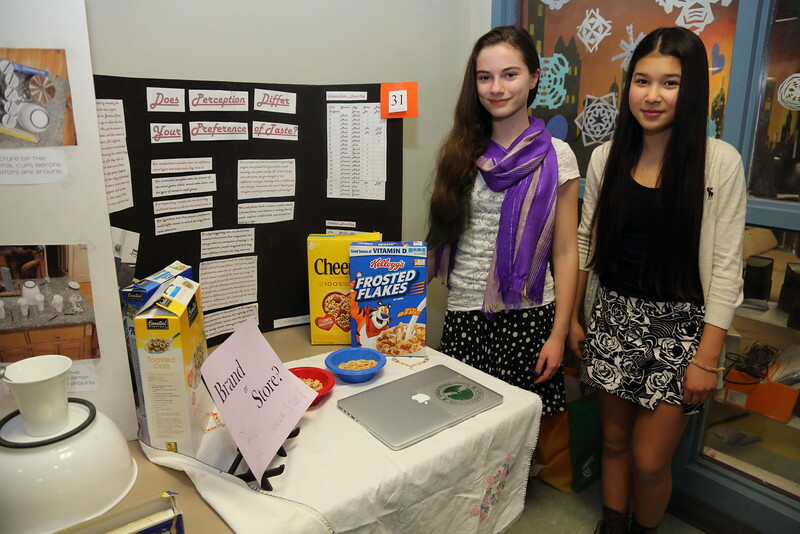 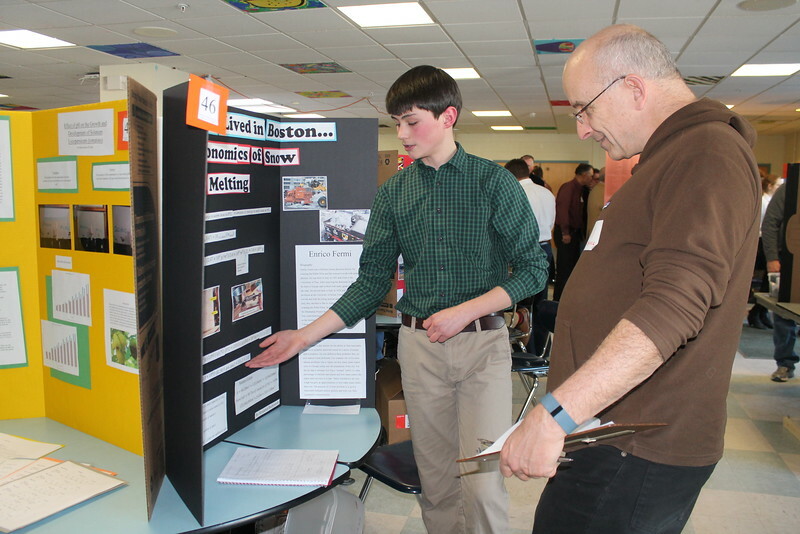 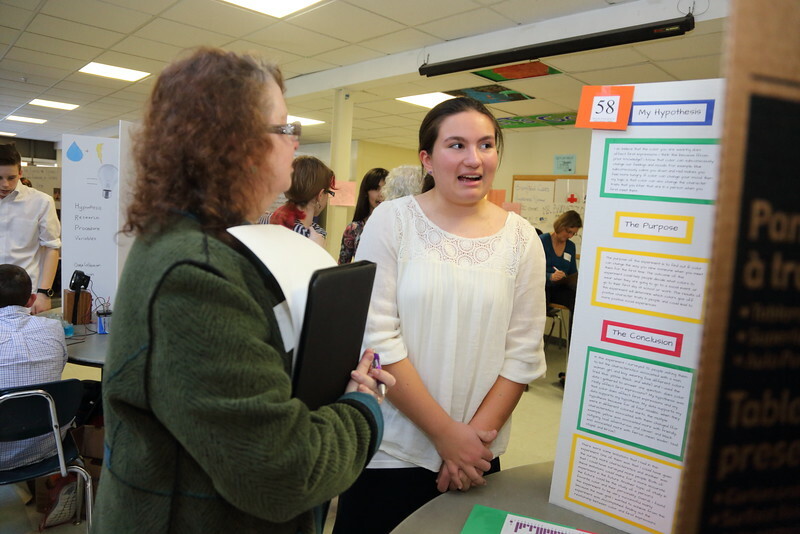 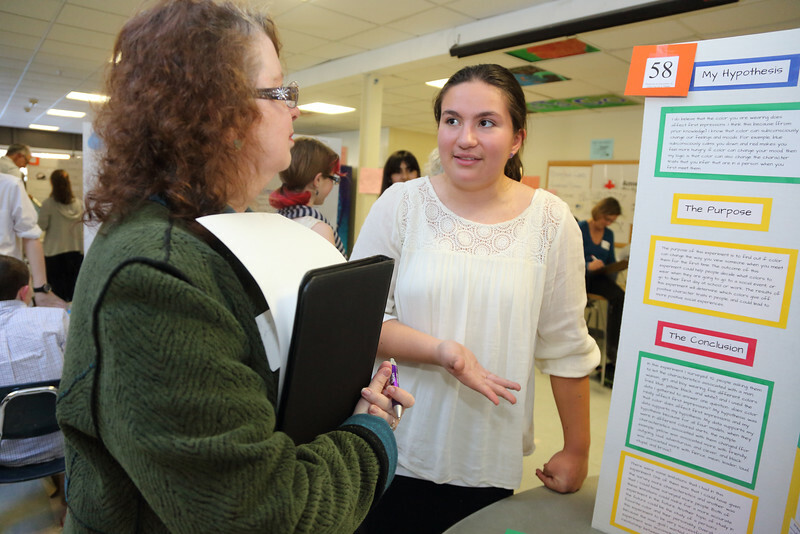 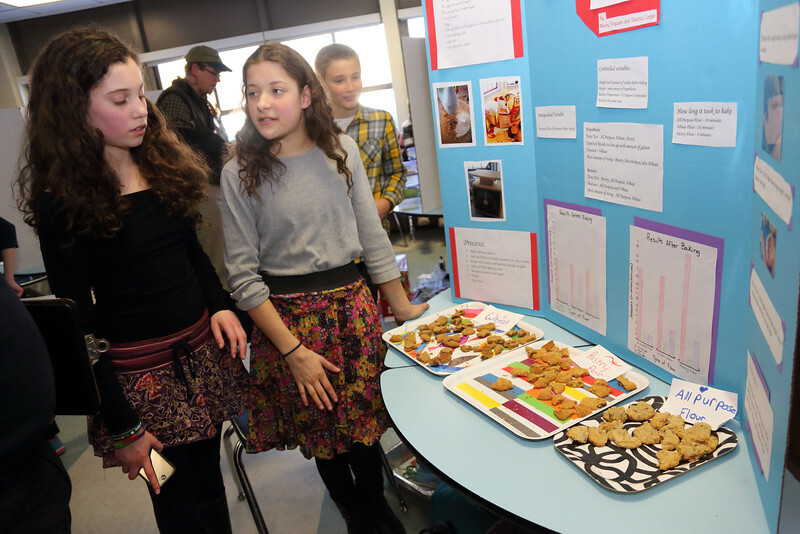 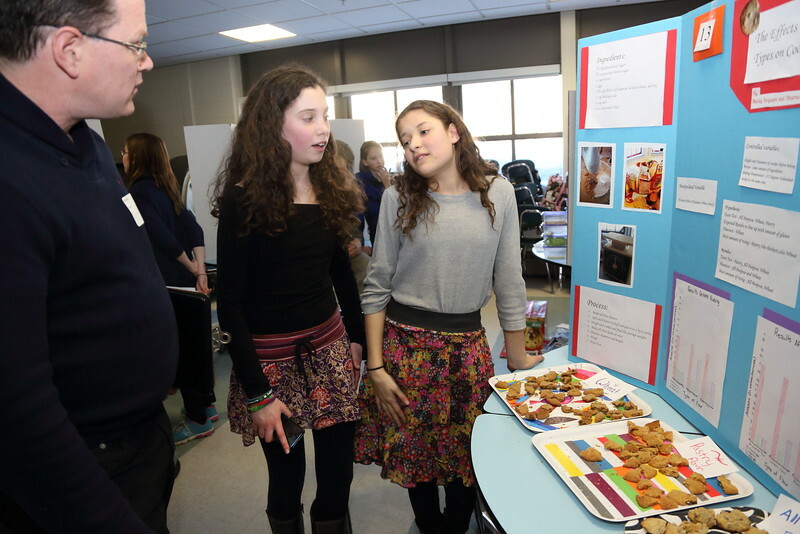 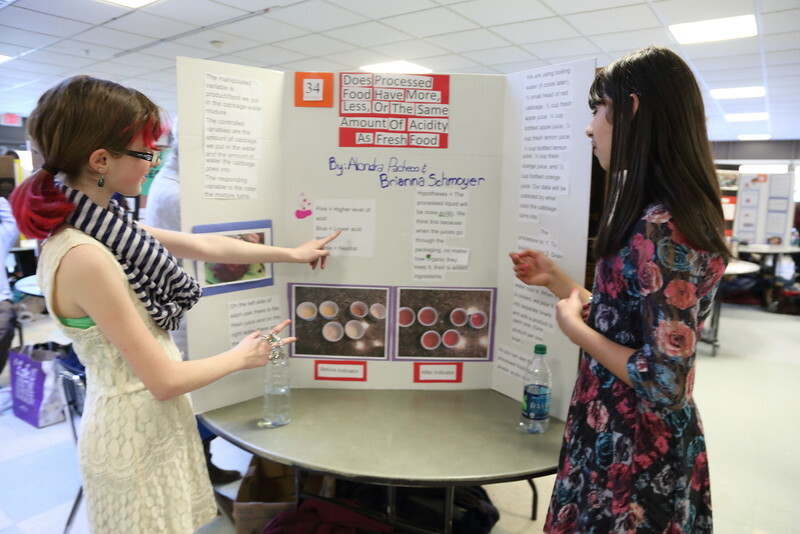 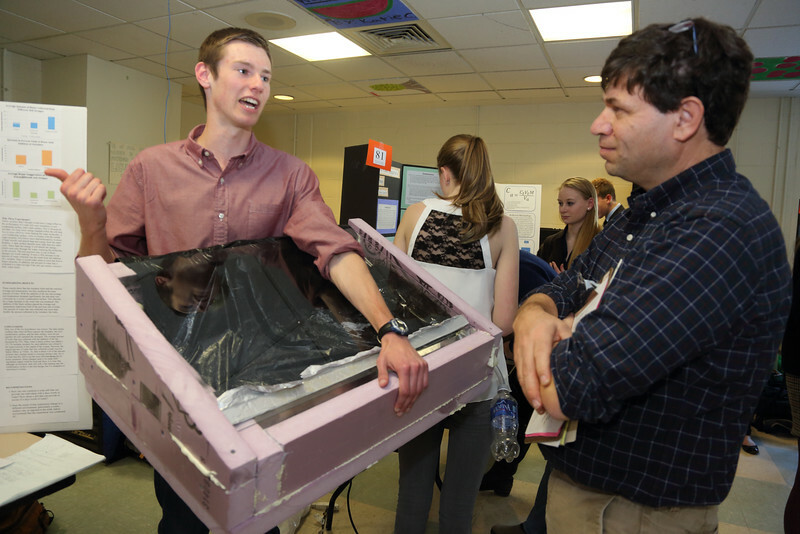 The Bromfield Science Fair was held Feb. 27 in the cafeteria.